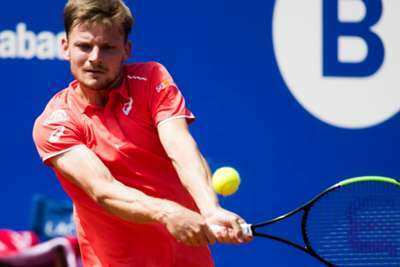 David Goffin produced a stunning fightback to reach the Barcelona Open third round on Tuesday, rallying from a set and two breaks down to beat Marcel Granollers 4-6 7-6 (7-2) 6-2. The Belgian's campaign appeared over at 4-6 1-5 down but his remarkable recovery, which included a saved match point, earned him progression. Goffin will face Leonardo Mayer or Karen Khachanov in the next round, while Roberto Carballes Baena's reward for seeing off Andreas Haider-Maurer 6-2 6-4 in the first round is a meeting with 10-time champion Rafael Nadal. Martin Klizan beat Federico Delbonis in three sets to set up a clash against Novak Djokovic in round two, while Roberto Bautista Agut, Feliciano Lopez, Adrian Mannarino and Malek Jaziri all moved into the last 16. Bautista Agut had to come from a set down to win his second-round tie with Ivo Karlovic 6-7 (4-7) 6-2 6-4. At the Hungarian Open, there were wins for seeds Jan-Lennard Struff and Andreas Seppi, while 18-year-old Zsombor Piros - winner of the junior singles title at the 2017 Australian Open - will return on Wednesday to complete his ATP Tour debut after bad light halted his first-round clash with Mikhail Youzhny at 6-3 5-3 to the Russian.